I am moving to a new server. 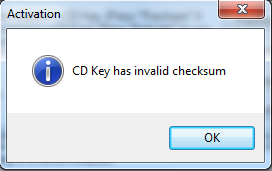 "CD Key has invalid Checksum"
You will get the error "CD Key has invalid Checksum" when you tried to activate CD KEY of the wrong product. You are trying to activate QODBC Desktop driver using QODBC POS CD KEY or using QODBC Online CD KEY. So you need to make sure that you are using correct CD Key. You can't use QODBC Desktop CD KEY with QODBC Online or QODBC POS vice-versa.